A direct deposit form comes in handy when an individual wants to receive a payment directly into their bank account via an electronic transfer instead of through a paper check. 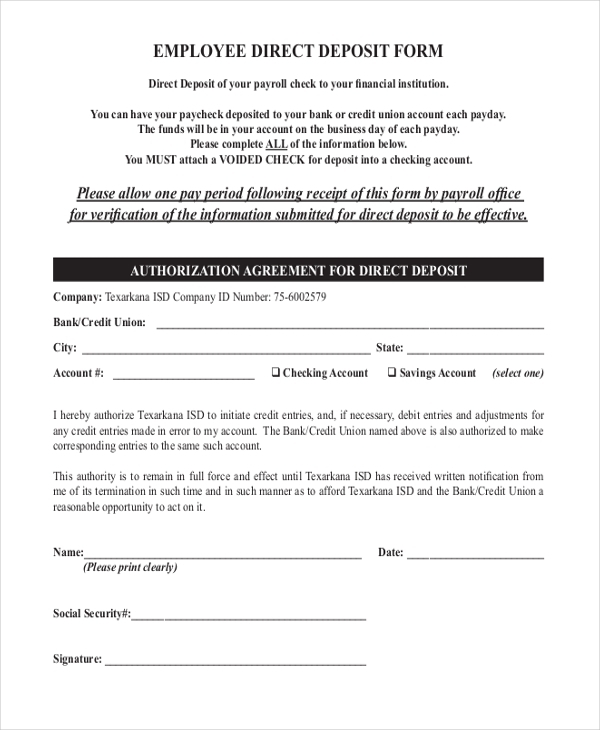 There are many kinds of direct deposit forms which are available in different avatars and used in bank-related operations worldwide. We give a rundown of some of the most popular Deposit Forms. These forms are generic and can be used by people from all walks of life. 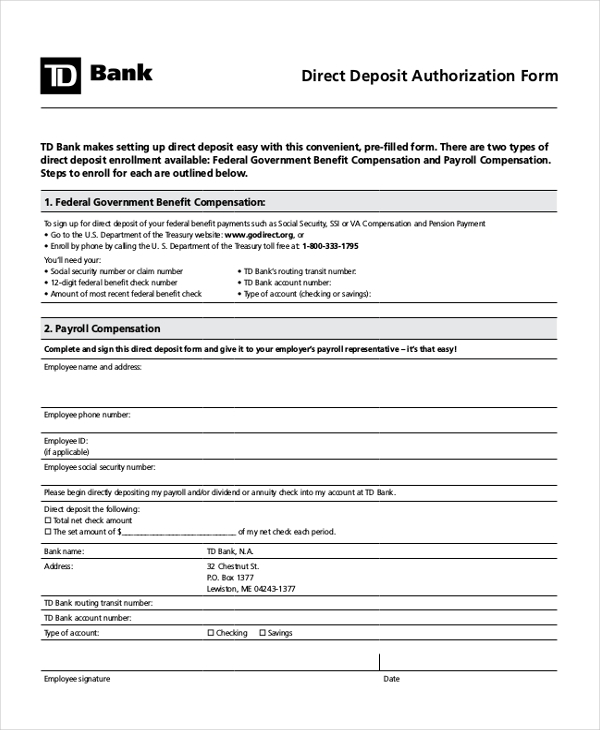 Be it federal government benefit compensation or payroll compensation, a direct deposit authorization form sample can be pre-filled by applicants wherein they provide the government or employer to direct the funds to be deposited directly into the designated bank account number which is specified in the form. If a benefactor of deposits would like to change information of direct deposit or a new applicant would like to start direct deposit, for this purpose a Direct Deposit Request Form needs to be duly populated with accurate information and details. 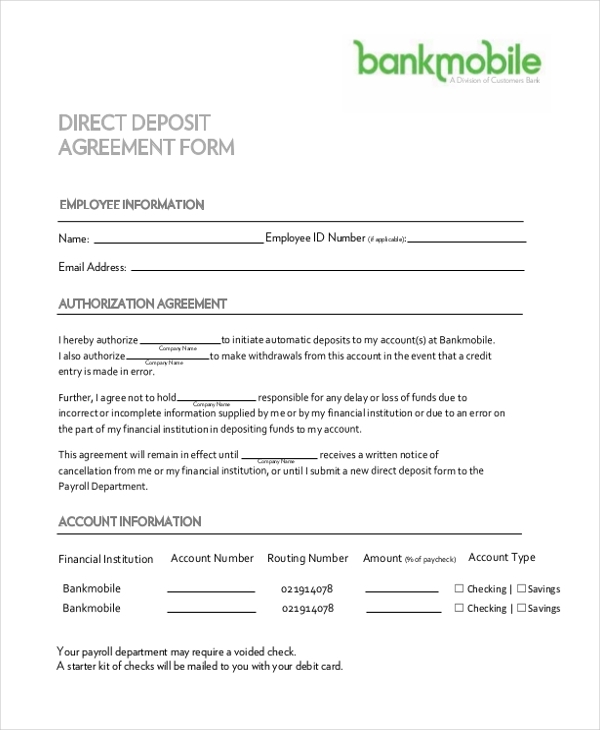 A direct deposit agreement form is utilized in a situation wherein a benefactor and his employer reach an agreement that the latter shall electronically transfer the funds as per the pay cycle routine. 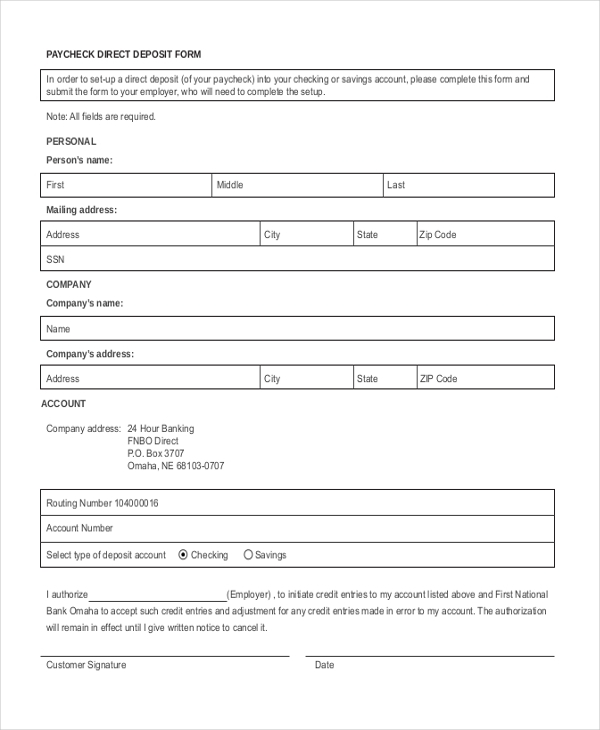 Such a form needs to be filled by the payee giving authority to his employer to direct the deposit of funds into the specified bank account number mentioned in the latter part of the form. 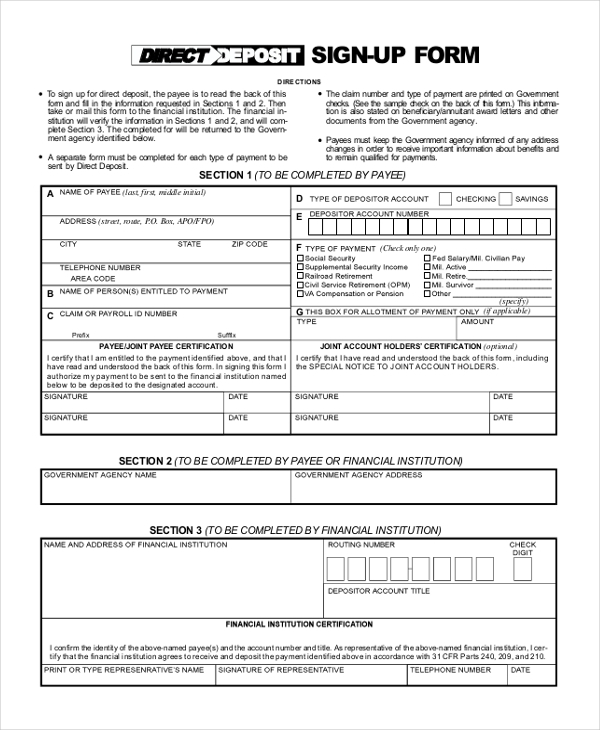 In case an employee would like his salary to be accredited directly into his bank account, he needs to fill and file a Direct Deposit Payroll Form wherein he must specify the required details and submit the form to the payroll department within the stipulated time period. 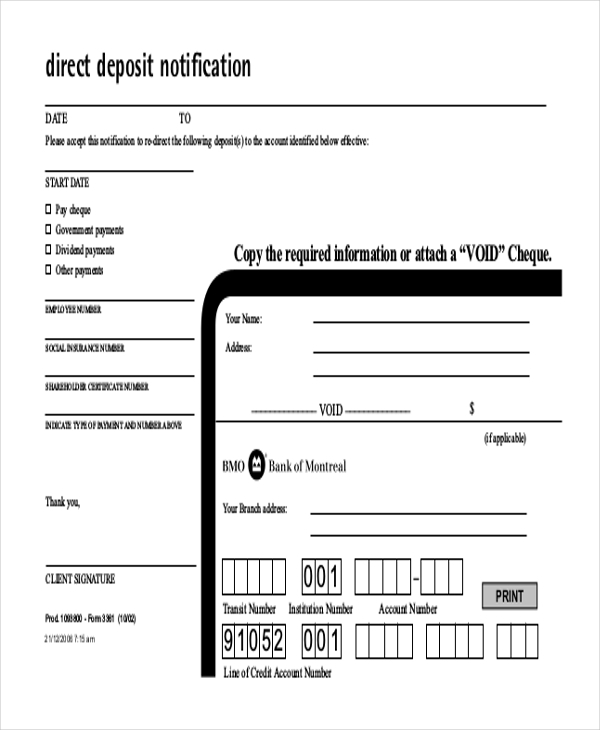 In the case of a change in a direct deposit benefactor’s existing bank details, a direct deposit notification form needs to be populated with the necessary information, notifying that that bank details have been revised and so the deposits are redirected to the account number identified in the notification form. 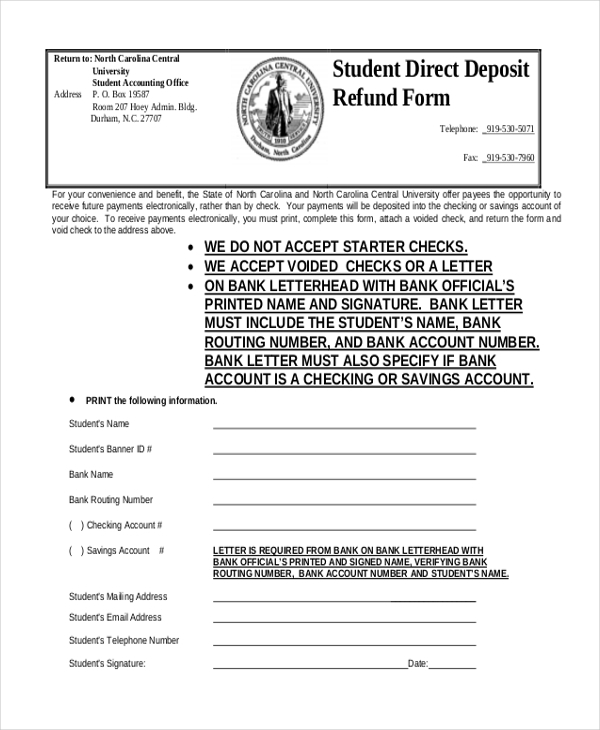 In case a student is liable to receive refund payments from college or university, he can request for a direct deposit of the funds using a Student Direct Deposit Refund Form. The form needs to be furnished with required relevant information and the authorities will use the same to direct refund payments accordingly. If a person wishes to receive direct deposit of his salary or social security payment from the government, he can apply for a direct deposit of funds. 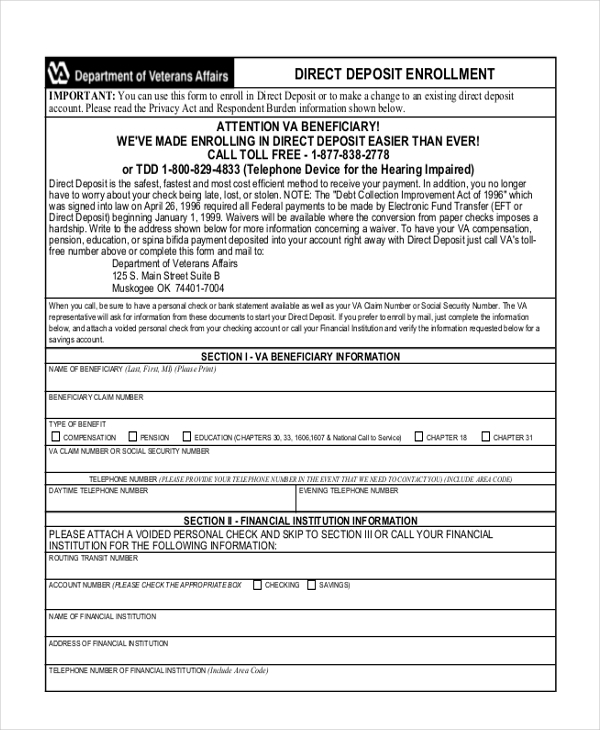 A direct deposit enrollment form is used for this particular purpose. If a beneficiary would like to avail a direct deposit facility, he or she needs to apply for the same using a paycheck direct deposit form. Direct deposit is touted as the safest and most effective method to receive a payment. The payment cycle is timely and hassle-free both for the depositor and benefactor. In case you’re an employee who is not able to work due to a disability or illness, you are eligible to receive social security/payroll payments from the government/employer. If you’d like for the funds to be wired electronically, you can express your intent by filling up an employee direct deposit form. A social security deposit form is a handy tool if a benefactor of social security deposits would like the payments to be directly deposited into their designated bank account by the depositor. The prime purpose of direct deposit forms is that they facilitate benefactors to receive their social security payments or payroll compensations by means of electronic transfers which means that the stipulated amount is directly deposited into the benefactor’s bank account. Direct deposit forms are also used in events where there has been a change in a benefactor’s bank information and their depositor needs to be notified about the same. 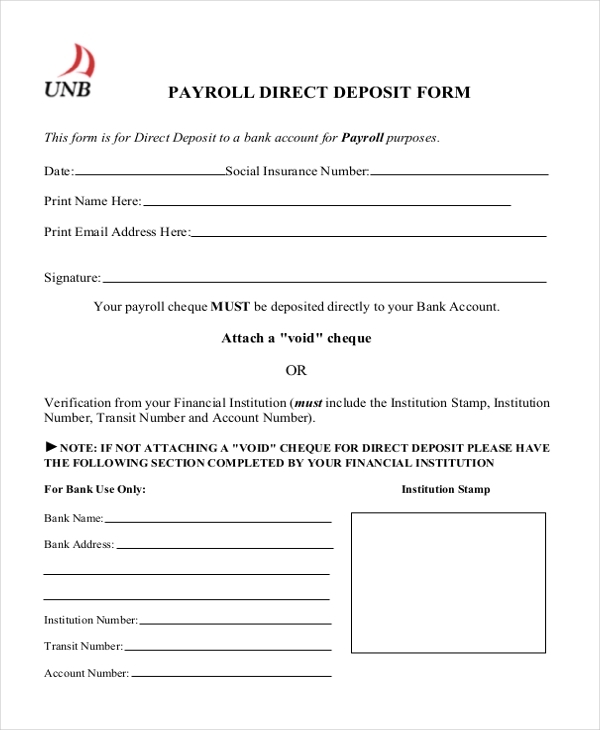 You may also see Payroll Direct Deposit Forms. Where to Get These Direct Deposit Forms? Direct deposit forms are available on a host of websites. If you’re looking for samples, well, they are also easily available. The best part about sample forms is that they are available in multiple formats which are easily downloadable, editable, customizable and printable. Direct Deposit Forms are ideally found in the following formats – MS Word, Excel, and PDF. You can also see Security Deposit Receipt Forms. Direct Deposit Forms are a big bonus for benefactors of the deposit scheme. 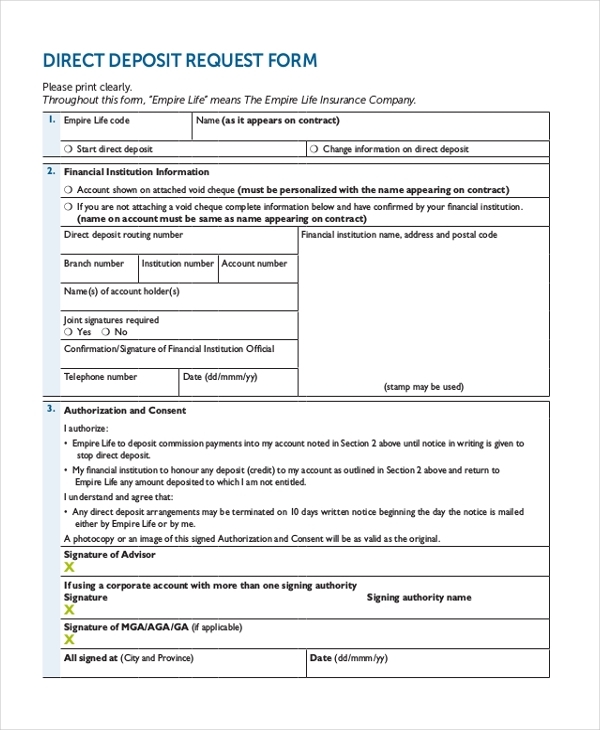 The forms make it very easy for applicants to convey their depositors that they would like to receive funds by means of one-to-one bank transfer. In case there is any revision in the bank information of a payee, the same form can be utilized to inform about the change.